When you are considering what gear to buy, there are a few thing you should consider. Brand is a sensibly important fact as usual synonymous of reliability. Also comfort, what style of combat you practice and what type of training you use it for, but all of this should be summarized and then paired with the often most important question of all… how do I get the best quality for the cheapest price? I had a chance to use many brands, from Twins to Bad Boy, RDX to Leone. But at the end this is the second pair of my Fairtex SP3 shin guards (I still have my first pair looking brand new after 2 years, but I moved to other country and could not bring most of my gear with me! ), and there are many reasons for it. These SP3 shin guards are made of synthetic leather, and there is absolutely nothing to complaint about it. It is a solid pair of shin guards, thick enough for great protection, not bulky to make you look goofy or super thin to end up with bruises. The padding is made of a triple layer foam, with an extra raise on the shin-bone area and in the middle of the instep, and it wraps all around the shin to ensure better impact absorption even on the side of the leg. The inside is made of cotton lining and efficiently prevents your leg from slipping and it feels comfortable on the skin. The hook and loop velcro strap system has metal loops which are firm and stable, but in my opinion the system is a bit old and could be updated to a newer and more functional system. The finishing on the velcro straps are strong and of very good quality and they don’t seem to give up any soon. The stitching is perfect as you expect from a top quality brand. The inner lining feels light on the skin and has a good grip so that the shin guard does not move at all during sparring. For the Large size, the shin length is 36 cm (just over 14”) and the instep is 12.5cm (nearly 5”), and it makes the shin guard reach just under the kneecap and the instep does not cover your toes. These makes my movement much more free and makes feel much more free to move and less sloppy when for example teeping if my toes are not covered. In addition, I prefer the knee not to be covered as it makes it much more realistic when drilling on knee strikes. The top strap, which is the longer, I measured it 36 cm, I have decently big calves and the strap is long enough to reach all around and close securely. Notice that fresh out of the box the shin guards will look a bit flat on your leg. 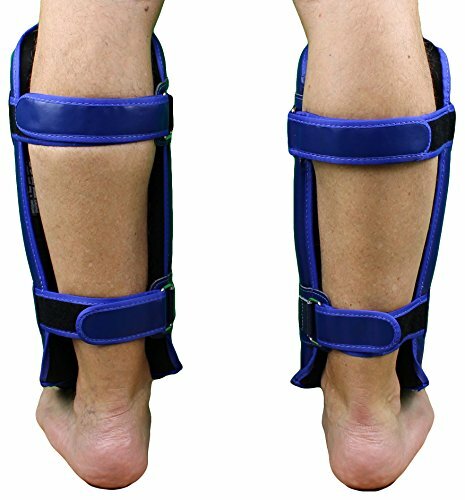 Tighten the straps as tight as you can and keep them like that overnight and in the morning, they will be perfectly rounded and with a snug fit around your shin. A plain and simple black shin guard with no flashy colors or writing all over or different fabrics and materials overlapping trying to give a spaceship appearance with eventually no super power to add to your legs. Solid black surface with Fairtex logo, two velcro straps with metal loops on the upper and lower calf and one elastic band under the foot. When it comes to practical use of this shin guards that is when you value your investment. I feel free to move and kick properly as the shin guards do not cause any impediment, and still sure, that I won’t get hurt, as the padding is really solid and protect you even if you happen to kick on the knee. One little downside is that the instep is not super thick and you can get hurt if not kicking properly or if your partner does not know how to check kicks. Also at the ankle, the padding could work better as it does not protect as efficiently as, for example, the Top King. Overall, I love the minimal aspect of the shin guard: it does not feel bulky at all; in fact, you end up forgetting you are wearing them, and even when drilling kicks and blocks with my students, you don’t have to sacrifice realistic speed or power just to play safe. Fairtex has been delivering top-notch products for over 40 years and they know what they are doing. The shin guards are not the fanciest, not the most protective ones, not as light as the sleeve ones…They offer optimal protection with the optimal weight and comfort and the optimal price! And people often forget that, OPTIMAL! You have a great long lasting piece of equipment that allows you to move and train properly, and to kick hard and check hard kicks in a realistic way, for a very affordable price. 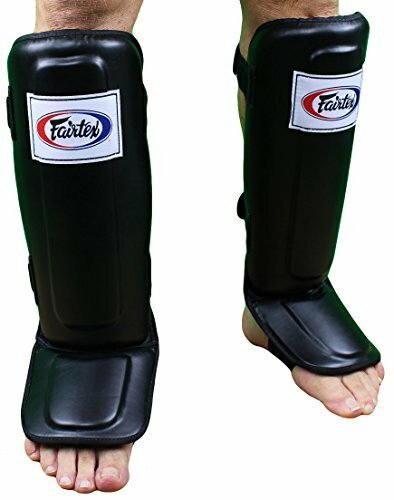 For the price on the market, I would say that the Fairtex SP3 are a must, but if you are just starting training, I would recommend a more protective pair of shin guards. The Fairtex SP5 could be a great option, although you will have to sacrifice a bit on the weight and mobility. I would recommend the SP3 to an intermediate to advanced student, more than to an absolute beginner. 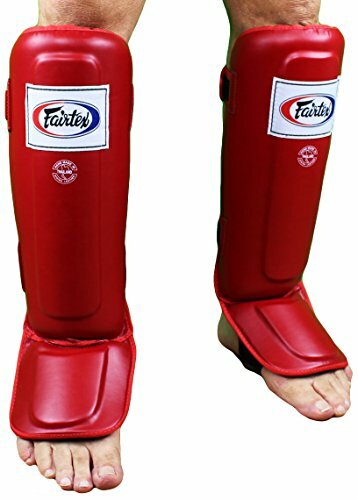 The minimal and optimized design makes the shin guard extremely light and effective, but a beginner with little if no proper kicking technique might struggle a bit the open toes area. The thinner layer of padding on the instep, the knee not protected, and may end up getting hurt here and there. Alessio purchased this Fairtex Muay Thai SP3 Shin Guards himself for the full price. This did not influence the outcome of this review.